Brands do not exist! Why Cultural Partnerships pay off. Brands do not exist, yet we live in a branding culture*. Well that is what, among others, scholars O’Really and Daragh (2005) affirm. From this perspective, brands are born by means of interactions with consumers. This article reflects around the potential of strategic partnerships between brands and cultural initiatives (Cultural Partnership) not only to contribute to the construction of the brand identity but also as means to actively contribute to defining the world in which we live. The impact of investing in a cultural partnership goes beyond the cultural activity in itself, as it contributes to build up and promote a certain culture, a way of life. In other words, it contributes to the construction of meaning of the world in which we live. When we think about generating impact by means of cultural actions, activities or projects we are aligning our strategy with the sense of being more than pretending or looking like. With actions rather than words. In fact, it is not a “marketing or advertising strategy” what we have to think about but a venture that will have a positive impact on our brand as well as on our society. First step to developing a successful Cultural Partnership is to think “out-of-the-box”, beyond the product/service – Brand – itself, connecting its uses in relation with social challenges. There is no better way to promote your product or service than with a proof of how its active functionality works to impact our society in a meaningful way. It will help me to … It would give them the chance to … It does it contribute to foster… Demonstrate it putting your affirmation into practice by means of inspiring actions, stories and engaging experiences. 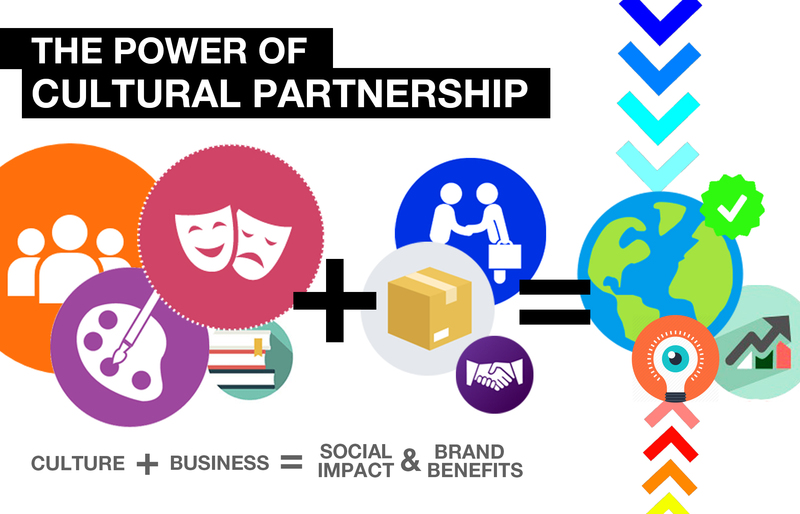 Beyond advertising, endorsement, sponsorship or even cause related marketing; Cultural Partnership is a hands-on cooperation, a co-creation (brand & cultural actors) process. It is a joined journey that will add to the equation real added value. Experience tells us that best ideas come from a common dialogue table, where the dynamic and creative addition of both sides expertise can deliver the unexpected plus: 1+1=3 or using Aristotle words: “The whole is greater than the sum of its parts”.Although possibilities are unlimited, it is to remark that setting-up a Cultural Partnership is a co-creative process that aims to deliver a unique tailored proposal.When working in Cultural Partnership projects, partners rely on cooperative added efforts towards shared goals, visions and missions. Being “Mission & Vision” a start point from where cooperation, mutual trust and a unique cultural proposal can arise; a meaningful one, with social value and significance that will generate Cultural Creative Capital, the economic fuel of a more human and sustainable society. If traditional advertising is all about mobilizing feelings to motivate purchase (persuasion = short term effects), cultural cooperation is all about taking action (experience, reflection = long term impact). In any case, there is no better return on investment than to contribute to build a better world, no doubt it will pay off with positive side effects on your audiences and brand identity. By means of Cultural Partnership, projects or actions, your brand will not only be able to connect with audiences in a personally relevant way but also you can discover unexpected uses of your products. It can even help to trace bridges to establish extended partnerships with additional strategic third parties, complementary actors that sharing a common vision, can add an extra plus to the whole. Indeed “Culture is social glue”. Relationships between business and culture are to be updated, and there is no better way to do so than to define strategies of mutual benefit, powering up their role as social actors. Yes Business are also social actors and therefore they can be forces for social good, and still be a successful business. Business have an impact on our society, yet they set and promote trends, their products and innovations define new horizons and standards; and with it, they contribute to build the world we live in, adding meaning and value. The identity of a brand is made of dynamic intangibles, the named interactions; well-conceptualised and well-executed cultural actions come embedded with high doses of them. Cultural Partnerships will help your brand to elevate the link between purpose and profit. As Barker states* “identities are discursive constructions”, they are build up, constructed, in an on-going basis. A continuous, which is connected to our daily actions and behaviours. What is more, investing in Cultural Partnership activities will also contribute to implementing your employees’ identification with your company’s mission and vision.Adding a layer of “sense of purpose”. You already know that when people have meaningful jobs they are more motivated, and the company becomes more profitable. Well, nothing new has been said, but reminders help to keep the horizon in sight and keep a clear vision why playing for cultural projects can turn into a successful long-term investment. Already thinking about what could you do in terms of Cultural Partnership? At ZZZ we heve more than 10 years experience conceptualising and executing successful cultural partnerships.